Welcome to another wonderful Dolly Insider’s Exclusive Interview. In this month’s interview The Dolly Insider presents the talented designer of doll clothes, Satoko Endo. Satoko Endo, who you may know as Chikuro, was the designer behind Azone International’s EX-Cute Sera of Green Gables & Sera of Blue Gables. In this interview Endo shares some insightful tips and helpful advice on designing & making clothes for dolls. We hope you enjoy the interview and discover something new about Chikuro. I began operating under the dealer name of “Chikuko” in the summer of 2005. I sold the doll clothing that I created at events and on web sites (only in Japan). I strove to create simple and cute clothing that would bring out the charms of each doll. How did it feel to design and collaborate for Azone International's Sera? The design image for the theme “Anne of Green Gables” came easily, fit well with the atmosphere of Sera-chan, and I believe that in the end it came out very well. Also, this collaboration turned into a great opportunity for more people to become familiar with “Chikuko,” so it was an enjoyable and important experience. What challenges if any do you have when sewing doll clothes? When something doesn’t come out the way I envision it, and I have to try over and over again, I become somewhat depressed. What aspect of designing clothes do you enjoy the most? I enjoy collecting colors, patterns, and materials that will suit the doll well, and then I pursue “cuteness” and express it in a way all my own. 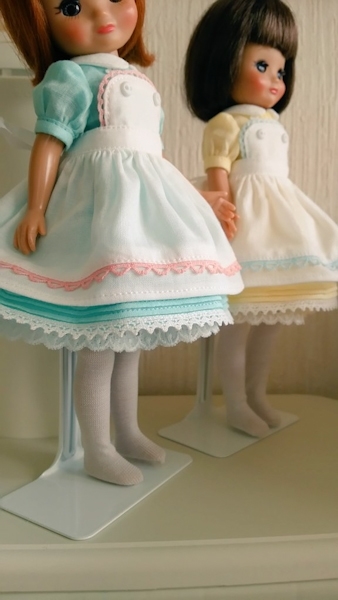 What is your #1 tip you would give to someone thinking about sewing their own doll clothes? Once one has an idea in mind, I believe that it’s best to get one’s hands moving and to give it form. If it goes well then it will be a pleasing experience and make one want to create more, and if it doesn’t go well then that is an opportunity to reflect upon the areas that need improvement and incorporate those into the next opportunity. Currently I use my blog and twitter account to introduce my works. 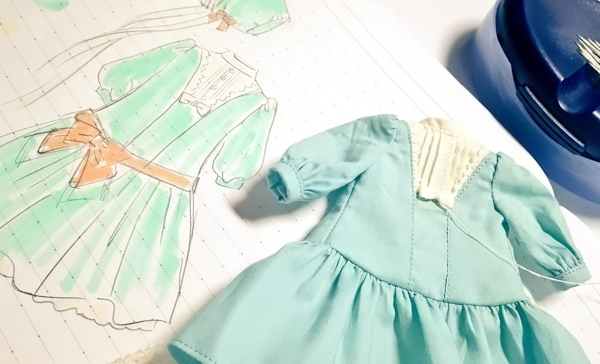 The Dolly Insider would like to thank Satoko Endo/Chikuro for taking the time to answer our interview questions and for the wonderful insight into the process of designing clothes for dolls. 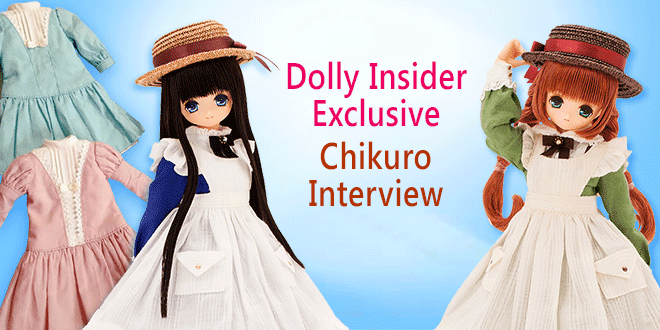 We hope you, our readers, are now more familiar with the Chikuro brand of doll clothes. you are the winner of Sera of Green Gables Doll! All you have to do is leave a comment on our blog in the comment section below related to the interview or Chikuro's designs. The winner will be randomly selected. We'll contact the winner by email and the winner will be announced by June 30, 2016. Thanks for reading the interview and taking part in our Sera of Green Gables Giveaway. Chikuro designs are so sweet and beautiful. The outfits have such beautiful detail and Chikuro’s advice is very inspiring. I love her hat!! She almost looks like Aya from Mad Father. I hope that more dolls get made with her designs. I loved this intervieuw. I love making my own dollclothes, and because of that, I love to look at what others make. Chikuro has a style I totally fell in love with. So cool to read about the way she works, Thank you for that! Thank you for the interview, it’s a great insight into the creation of the character. I like the cute outfit that Sera’s wearing. What a sweet interview. I am so in love with Chikuro’s dolly clothes! Her designs are so simple and pretty. I would love to one day be able to make dresses like these for my dolls. Thank you sharing this interview with us! I’ve been interested in making doll clothing and when I tried I discovered it was so much harder than I had originally anticipated. Props to the artist for making such beautiful clothes! The craftsmanship for these outfits are so nice >< I especially like the dreamy nostalgic quality that these designs convey. Work hard chikuro!!! cheering you on!!!!!! My sincere compliments to Satoko Endo / Chikuro on such wonderful tiny outfit details as it is not easy to design and make to such a small scale. I enjoyed reading your interview – the clothing by Chikuro is so beautifully made! I appreciate how she designs to complement the doll and not overwhelm it. That is why they look so perfect on them. Thank you for sharing this interview with us! Chikuro’s designs are so classic. Lovely sense of color, and just the right amount of embellishment, never too much or too little, while still being eye-catching and different from other designs. Thank you fur sharing your talent with the world! Reading this interview was interesting and in some respects, rather enlightening as well. I want to make some doll clothes myself in the future (for personal use), and so seeing how intricate Chikuro’s designs/clothes are inspires me — I hope I too can make something that detailed someday, and it’s reassuring to know that things don’t always go as envisioned for Chikuro too; I’ll just have to keep trying, and not get disillusioned. I wish more dolls that are only available in Japan -or not the US anyway- would be available to me. Any time there is a chance at something beautiful like this it is good. Some day I would like to walk into a store or a hallway filled with awesome dolls like this. I want to be surrounded by sweet dolls. These dolls are beautiful! I have the azone pureneemo yui hirasawa and she is so cute! Thanks for sharing this article! I can see the love for detail in Chikuro’s designs. It must be such a hard job to finish the tiny garments to flawlessly. I am also sewing my own doll’s clothes for quite some time now and improving with every piece I create. I hope to be able to start my own dolly clothes brand someday! Thank you for the interview! I always find it interesting to see the thought processes behind a clothing design. I really love the use of fresh colours in outfits pictured in this post and the design certainly brings to mind the term “cute”. I also get a bit of 50s and 60s vibe from the design which I adore. Those are some of my favourite eras for dress designs. What drew me to Sera of Green Gables was her amazing outfit so it was great to read about the designer behind that outfit. Wonderful designs that really bring the doll to life. I think what you do is pretty awesome 🙂 I look up to it! I sure do wish Chikuro’s work was available online. Seems like all the best doll clothes are always out of reach! It’s so inspiring. Licca dresses are amazing, can’t imagine how much work they took. I really enjoyed this interview, I was not familiar with Chikuro’s work. Now I’m doing research to find out more because of y’all, thank you so much for your website and great interviews. Those Victorian-style dresses for Licca-chan are really something amazing–the tiny lace details and the precision are fantastic. Thank you for introducing us to Chikuro-san! 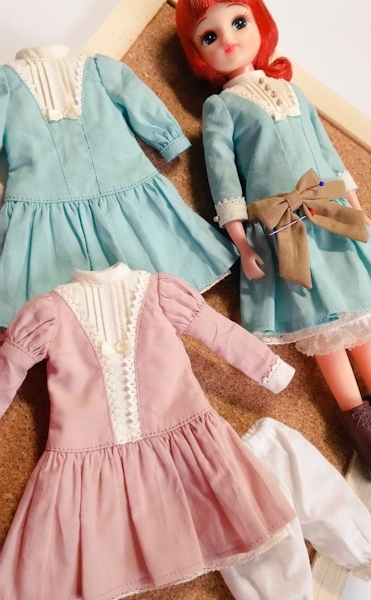 It’s great to learn more about the process of creating doll fashions and to be introduced to a maker, especially for those of us who don’t know or are still in the first stages of learning Japanese and thus find it hard to discover Japanese makers on our own. I will be following Chikuro-san’s works on their blog and Twitter with interest. I wish I could see Chikuro’s clothing with my own eyes someday. Thank you for publishing this interview! Her creations are so beautiful, intricate and inspiring. They really are miniature works of art. It’s lovely to see her sketches, too. Aw I love these outfits, Chikuro is a really talented creator *-* her work is as cute as these dolls ♥ I’m so admirative, this interview shows very well how your dreams can comes true if you work for it! Nice interview! All those tiny, perfect little pintucks make my head spin. She’s very talented. Thank you Dolly Insider and thank you to Satoko Endo for insight into a creator’s process. I am both a fan of Sera and Chikuro’s cute and refreshing designs. Love seeing an interview with a doll clothing designer! Chikuro’s clothes are so cute, I hope Azone will collaborate with her again in the future. The detail that goes into dolls and their clothes is remarkable. It’s truly an underappreciated art form. So cool to hear an independent designer got to collaborate for these dolls! The outfits really suit the Anne of Green Gables image. Nice interview! I’m always so impressed by people who make doll clothes. I want to try it myself, but I’m so nervous because I’ve never designed or sewn anything! I love the outfits for the Sera Gables girls, they suit them so perfectly. Very nice interview. The dresses are very sweet. I imagine it must be quite a unique experience to have a big brand or company approach you and ask you to collaborate with them. Very fun to read this! I’ve always been so impressed by the quality of Azone dolls’ clothing, it’s fun getting to know more about a person behind the designs. I really love Sera’s looks, her whole character for this version is beautiful, and the dress is so lovely. It really feels like she’s part of a romantic travel story. I would be very glad to recieve this doll if possible, I truly think she is one of the prettiest dolls Azone has created. I was estatic to think how easy it is to follow Satoko’s ideas to just try and try again if any idea does not work out. As an amateur doll clothing maker I totally agree with the creators answer to question 5. That is exactly how I feel when I get an idea in my head. I also love that blue dress in the picture, its so cute and simple just like how Satoko Endo says they want their designs to be. I love the color combination of Chikuro’s design! I can see how simple but eye catching her designs are base on the right amount of color picking and matching. 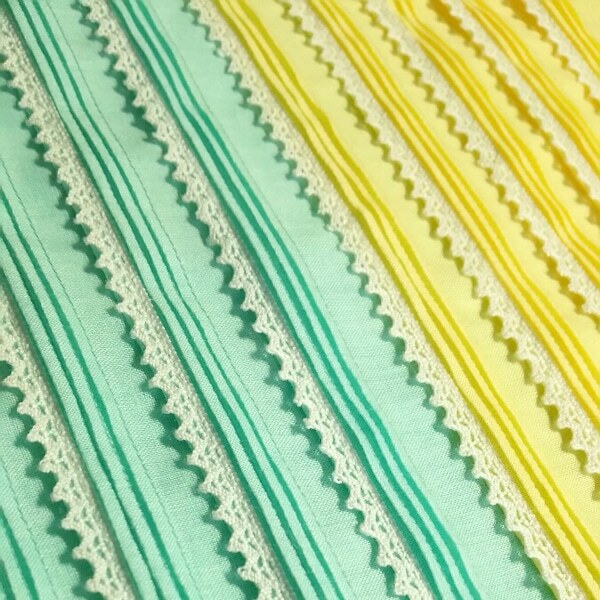 That ecplains once I see green and blue gables released, I am deeply in love with them! The fresh green and royol blue really compliment the doll’s hair and skin tone beautifully. With the white apron on top of the vibrate dress, there is nothing more adorable! Chikuro’s clothing designs look so pretty on Sera of Green Gables and Sera of Blue Gables. The photo below question 3 is especially interesting because we can see the design come to life. Thanks for letting us learn more about Chikuro! Well I’m totally agree when they said that when you succeeded in creating your own doll clothes you want to do more because this is exactly the way I felt when I finished a dress for one of my cuties. ^^ Yeah sometimes you have to change a bit your initial plan because something didn’t go well but in the end it’s a source of pride to see your work all finished!